8 November 2016, KUCHING: iCube Innovation Sdn Bhd (iCube) inked a Memorandum of Understanding (MoU) with Executive College yesterday to create more entrepreneurs among the youth in Sarawak. iCube founder and chairman Datuk Patrick Liew said the MoU outlined strategies for the business incubator which would lead to the formation of more substantial partnerships towards the development of entrepreneurs in the state. “iCube opens doors for collaboration opportunities and provides a platform for co-incubation for our partners. The partnership will extend to workshops, training, talks, seminars and events related to entrepreneurship grooming, e-commerce development, business coaching, leadership-building and more. “The aim is to provide young, aspiring entrepreneurs with expanded access to relevant information and potential opportunities,” he said at the MoU signing ceremony held at iCom Square. Assistant Minister of Workforce Development and Training Datu Len Talif Salleh witnessed the signing. iCube was represented by Liew while Executive College was represented by its chief executive officer (CEO) Sheila Sie. Liew said the sharing of expertise, knowledge and experiences between the two organisations would produce better results compared with a single entity labouring on its own. Meanwhile, Len Talif commended iCube and Executive College for recognising the importance of working together. “In a world which is rapidly transforming, one cannot afford to do everything on their own, which means you need to strategise and work together with the existing agencies and departments as well as private sector organisations who are experts in their fields. Citing George Bernard Shaw, Len Talif said: “The reasonable man adapts himself to the world. The unreasonable one persists in trying to adapt the world to himself. Therefore, all progress depends on the unreasonable man. “Hence, what you need is an unreasonable person (person who thinks outside-the-box) to come out with ideas at the end of the day with commitment and perseverance in order to be successful. Also present at the signing ceremony was iCube director Melvin Liew. 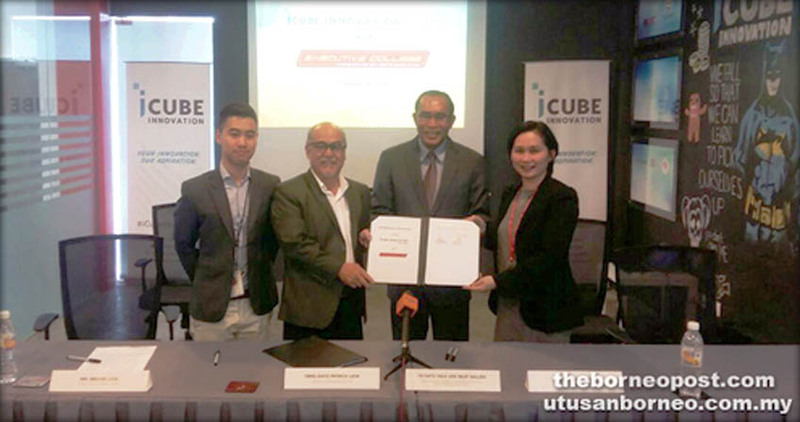 Since Aug 2015, iCube has signed MoUs with Tabung Ekonomi Gagasan Anak Bumiputera Sarawak (Tegas), Malaysian Global Innovation and Creativity Centre (MaGIC), FAME International College, Technology College Sarawak (TCS), OurYouth.my, Sarawak Children’s Cancer Society (SCCS) and Sarawak Entrepreneur Association (SEA). iCube was awarded MSC Incubator status by Malaysia Digital Economy Corporation (MDeC). iCube is an innovative business incubator–the first and largest of its kind in East Malaysia–with 10,000 sq ft of co-working spaces designed to facilitate the creation of start-up companies and nurture the growth of youth entrepreneurs. Aside from providing a fully furnished space and essential office facilities, iCube also provides training and workshops as part of their mission to create networking opportunities and bridge the gap between entrepreneurs, government bodies and the private sector. For more information, visit www.icubeinnovation.com.my.